Construction has started in Arkhangelsk on a large wind farm that will have a capacity 10 times greater than the total capacity of all of Russia’s wind-power plants combined. A new wind farm being constructed on the shores of Russia’s Arkhangelsk region will be one of the largest such farms in Europe and have will generate more energy than all of Russia’s current wind farms combined. Mezhregionsoyuzenergo closed joint-stock company and the German SoWiTec have partnered on the project’s construction. The latter has been building similar wind farms around the world from Europe to Latin America. It was the Germans that chose the White Sea coast, where the wind speed is 7.5 meters per second (16 miles per hour) and blows steadily. Even in areas with moderate wind speeds of 5 meters per second, one square kilometer of wind turbines can produce hundreds of millions of kilowatt-hours of electricity per year. The seacoasts are particularly well suited for such projects, which is why one of Europe's largest wind farms is being built in Arkhangelsk. During the first stage, its fifty power generators will produce 150-200 MW. That's enough to cover the energy needs of a city of 100,000 people. The project will cost about 16 billion rubles ($500 billion). Experts believe that wind farms can help solve some of the environmental and energy problems of the region by partially replacing outdated equipment and providing fuel for this remote northern region. The launch of the project is planned for 2015 to 2016. Gaining approval for the project, the partners said, may take longer than usual, because this is the first such facility in Russia. The wind farm will pay for itself in 15 years in Russia, compared with 10.7 years in Europe, since the project is not being financed either by the federal or the regional government. "These projects are designed for the long term," said Yuri Shulgin, the executive director of Mezhregionsoyuzenergo. "For the time being, it is more like a testing ground for Russia." The partners are confident that the project will fully pay for itself. Traditional energy sources are becoming more expensive, and by 2030 the Ministry of Economics predicts prices for the consumer will increase fivefold. At the same time, Soviet-era power plants are quickly becoming obsolete. According to experts, the potential of wind energy in Russia today is about 6.2 trillion kWh per year, which is several times greater than the country's total current electricity production. What does Russia already have? There are working wind farms that have been in operation for a long time. The largest of them is the Kulikovo wind farm in Kaliningrad oblast, which produces 5.1 MW. 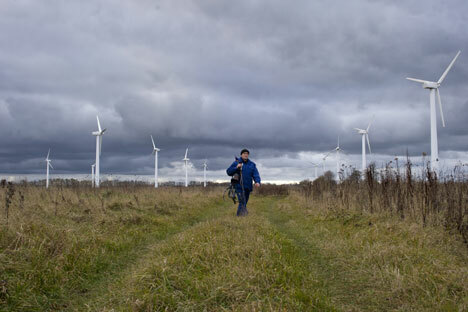 The first wind turbines were built there in 1998, then in 2002 the Kaliningrad regional administration, along with the Russian Ministry of Energy and the Ministry of Environment and Energy of Denmark, added a few more wind turbines, making Kulikov the largest wind farm in Russia. In addition, the Tyupkildy wind farm in Bashkortostan (2.2 MW), Kalmyk wind farm (1 MW), and Marposadsky wind farm in the Chuvash Republic (capacity 0.2 MW) are hooked into the electrical grid. Wind-power stations not in the grid include the Anadyrskaya station in Chukotka Autonomous Okrug (2.5 MW), the Zapolyarnaya station in the Republic of Komi (1.5 MW), the Nikolskaya station on Bering Lake in Kamchatka (1.2 MW), and the Markinskaya station in Rostov oblast (capacity 0.3 MW). Most of them were built in the late ‘90s or early 2000s. There are small wind turbines that mainly provide for the needs of companies located in Murmansk, Leningrad, Arkhangelsk, Saratov, and Astrakhan oblasts. The total capacity of wind power plants in the country is 17-18 MW.